The Network partnered with Blue Solutions to host a five-day training on Integrating Ecosystem Services into Coral Reef Policy and Management on March 6-10, 2017. Experts and participants from 12 different agencies gathered in Kona, Hawaii to gain experience in evaluating ecosystem services and how to effectively communicate the benefits they provide to people to guide decision making and inform management within their jurisdiction. 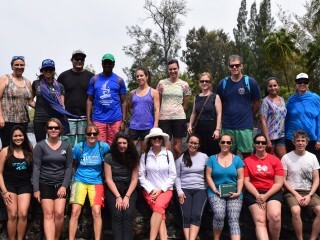 The workshop included a field trip to the Four Seasons Resort Hualalai and Kiholo Bay, where participants applied their new skills to identify the ecosystem services each place provides. Over the week, participants became familiar with different tools and resources for assessing and valuing ecosystem services and learned how to navigate and create maps with Mapping Ocean Wealth. Next steps for the participants include sharing key concepts and messages about ecosystem services within their jurisdiction and incorporating learned skills into their work, projects and plans. See photo highlights from this training. Check out this video from NOAA’s Office of Coastal Management, to better understand ecosystem services and learn about tools to use when evaluating the benefits and values.